I’m back!!! It has been a longgggggg time since I posted a blog, and I won’t lie…there are a few in my “Drafts” about my amazing experience on the sidelines of the 2014 Boston Marathon. But, you all will be spared of my Boston Race Report. Here is all you need to know: I ate all the food, drank all the beer, shopped, and had more fun than I think anyone has ever had traveling on crutches. I am so thankful for my mom and sister who were my race crew, even though I wasn’t racing. It was an amazing experience and I feel so fortunate to have been able to be a part of what will most definitely be the most emotional, monumental Boston Marathon in history. See you in 2016, Boston. Today, exactly 4 months after my last run, I laced up my Ride 6’s and ran 2ish miles. I have no idea how long it took, or exactly how far I went, but it was the happiest two miles ever. Leading up to Memorial Day I was SO frustrated with all my failed attempts to start doing anything with no leg pain. Every little thing I tried to do hurt my femur, which was obviously not completely better. 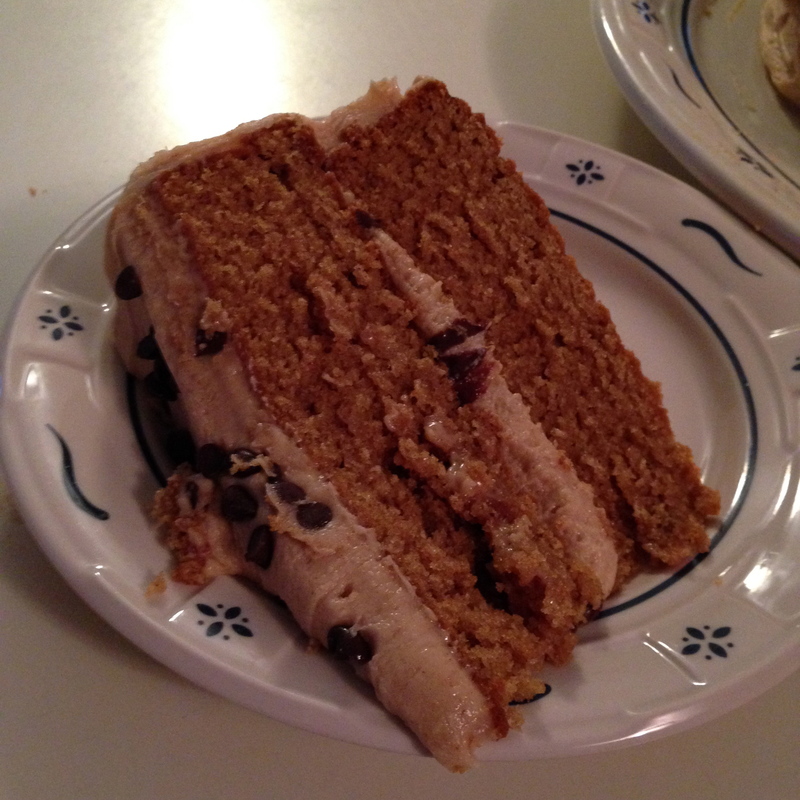 So, I decided when I went to Topsail Island (to be a part of one of my best friends weddings) I would do no exercising. I relaxed, I ate, I drank and I had the most fun I think I have ever had. I was there for 9 days. I am so grateful to have friends like mine. I decided when I got back from the beach I would get back to business. 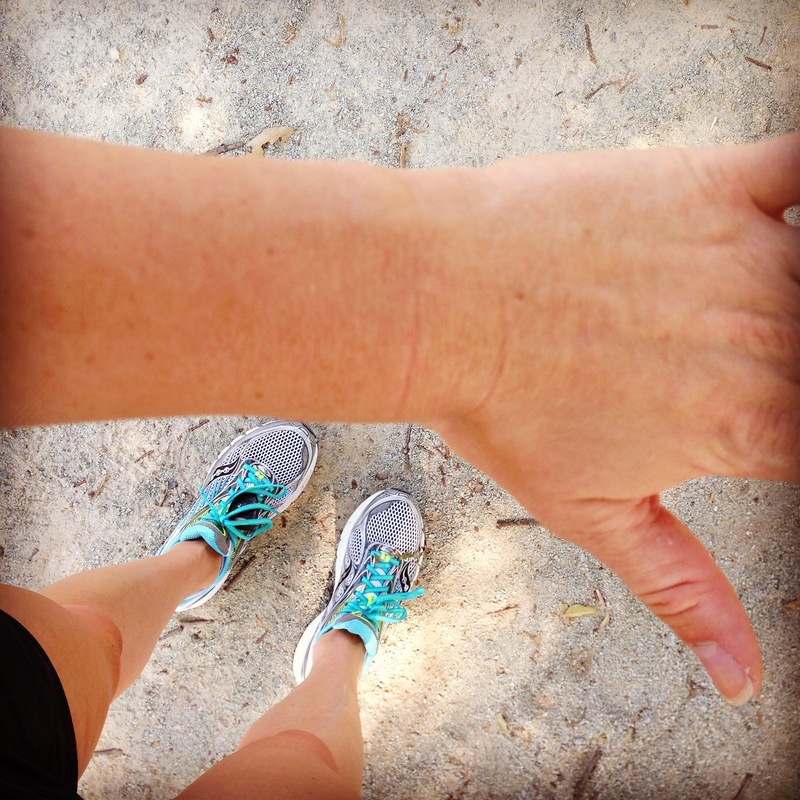 I joined a new gym, started eating a little better and kept my eyes on the prize – running. My amazing sports chiropractor made a deal with me – if I could get at least a 15 on the FMS – I could jog again. That was all I needed to hear and I was suddenly doing my pt exercises [almost] daily, and I have been getting up everyday to do some sort of horrid cardio inside the gym. When I had a stress fracture, I got an 11 on the FMS, the best you can get is a 21. Today I went back and I was feeling great, I have gone 2 solid weeks with absolutely no femur pain. I asked to do the FMS again…and I got a 16. I don’t think I’ve stopped smiling since. After a stern pep talk I left the EPC office and I went to the gym for a little bit of arc trainer action, and my glute bridges and planks. I tore out of the gym as fast as I could and drove to Duke’s East Campus, which for those of you that do not know, has a nice little soft 1.57(ish) mile loop around it. I swear it was the fastest, slowest, 2ish miles I’ve ever run. You know I ran it a little more than 1 time around. I rewarded myself with an iced almond milk latte and a chocolate peanut butter Larabar. 6 cups powdered sugar, sifted. Preheat the oven to 350 degrees. With a stand mixer, cream together the peanut butter, butter and sugar until fluffy. Add the eggs and mix well. Combine the flour, baking soda and salt in a separate bowl and whisk together. Slowly alternate between adding a little bit of the flour mixture and a little bit of the milk until everything is combined. Rub some butter (I used an Earth Spread stick) on the inside of two cake pans, make sure to get the sides and the WHOLE bottom of each. sprinkle a little flour in each. Tip: I like to sprinkle in the flour and then tap the side of the pans with the palm of my pan until the flour has spread out across the whole bottom of each pan. Divide the cake batter evenly between both pans. Use a spatula to make sure it is level and fills out each pan. Be sure to leave some in the stand mixture and on the spatula, to taste test, of course. Bake for 30 – 35 minutes (or until the top is golden brown and a toothpick comes out clean. 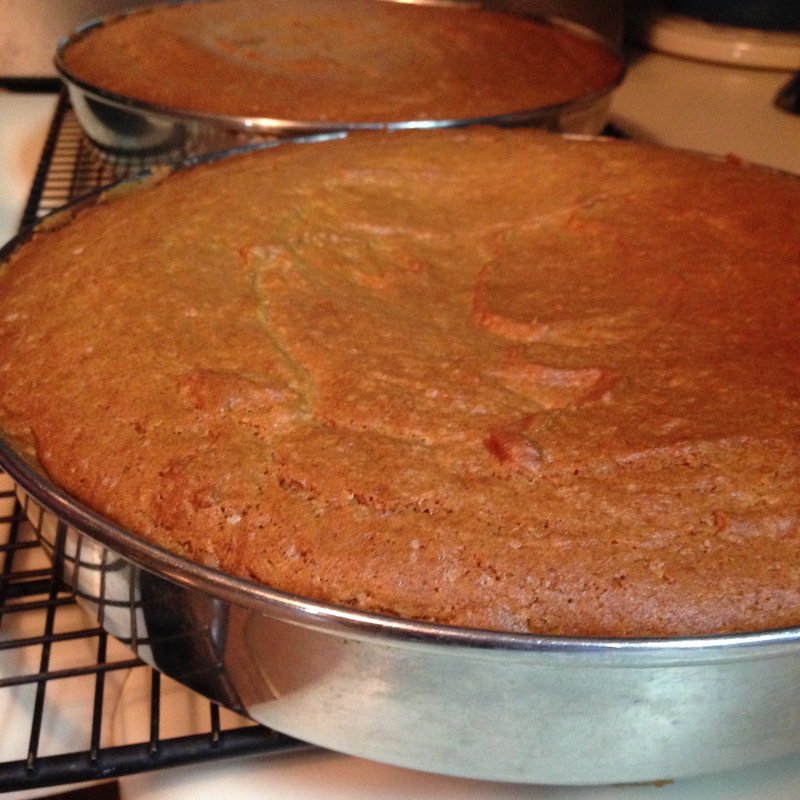 Remove from oven and place pans on a wire rack until the cakes are barely warm. 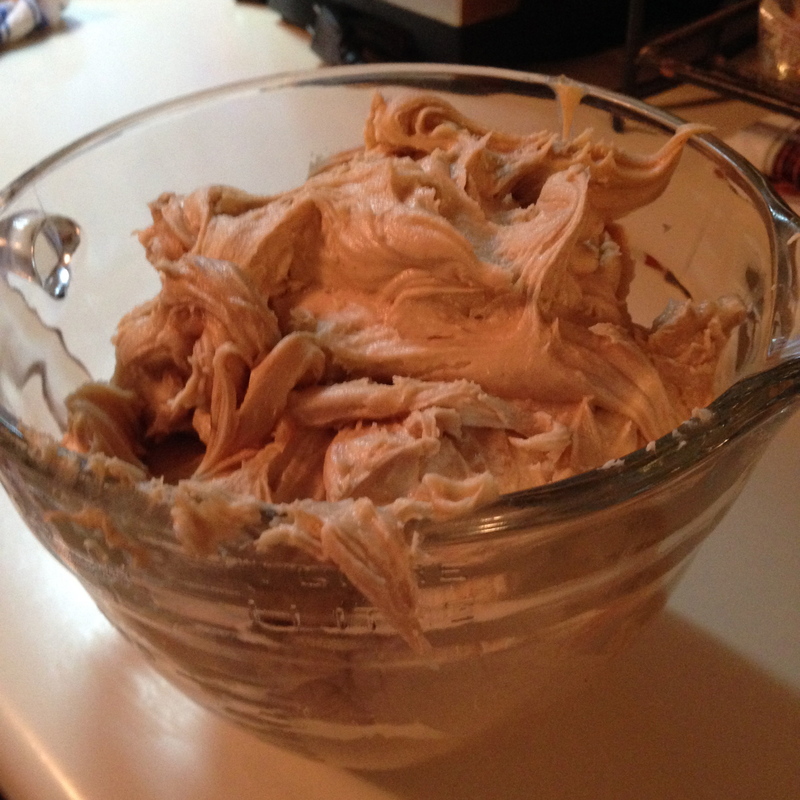 For the frosting, in a stand mixer, cream together the peanut butter and butter. Turn off mixer and add 3 cups of sugar and 1/4 cup milk. Cover stand mixer with towel and slowly turn on and increase speed until completely combined. Add the second half of the powdered sugar and milk, again, cover with towel, and slowly increase speed. 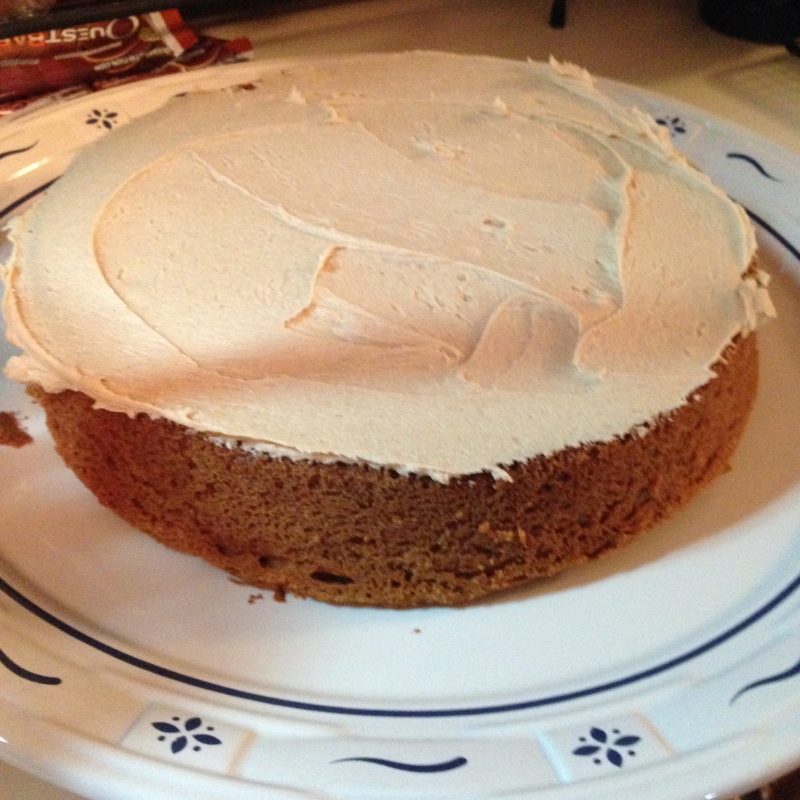 Mix well, until the frosting looks, and tastes…frosting-like. To assemble the cake, place one of the layers on a plate (I like to do bottom up, so that there is a flat surface to set the next cake on top) and frost the top of it, then sprinkle with mini chocolate chips. Then, place the other layer on top and frost the top of it first, and then the sides. It’s always best to put a big lump of frosting on first and then spread it around. 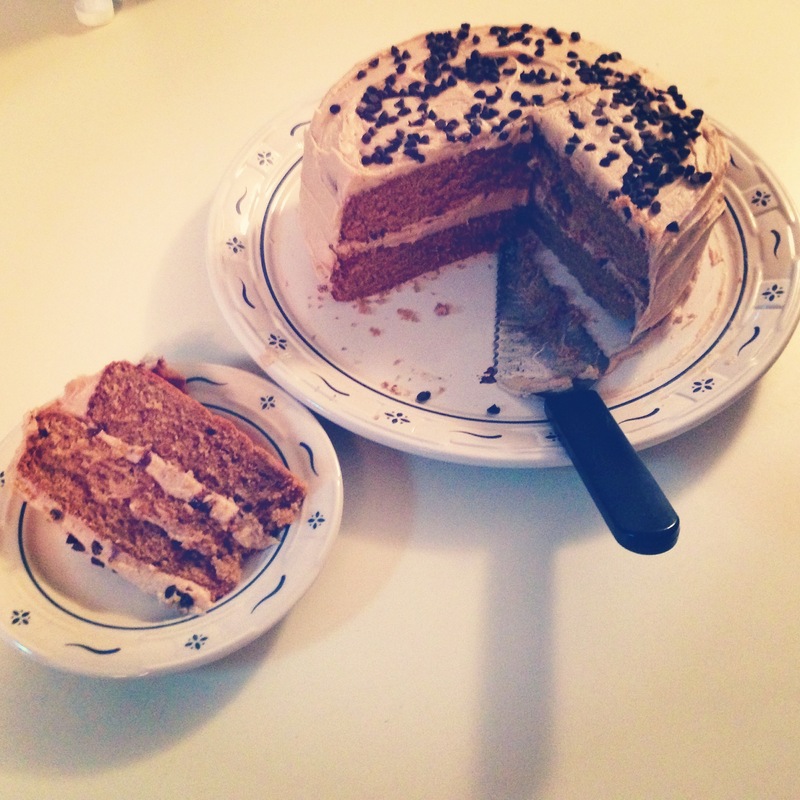 Never let it get to thin, otherwise pieces of the cake sometimes rip off. 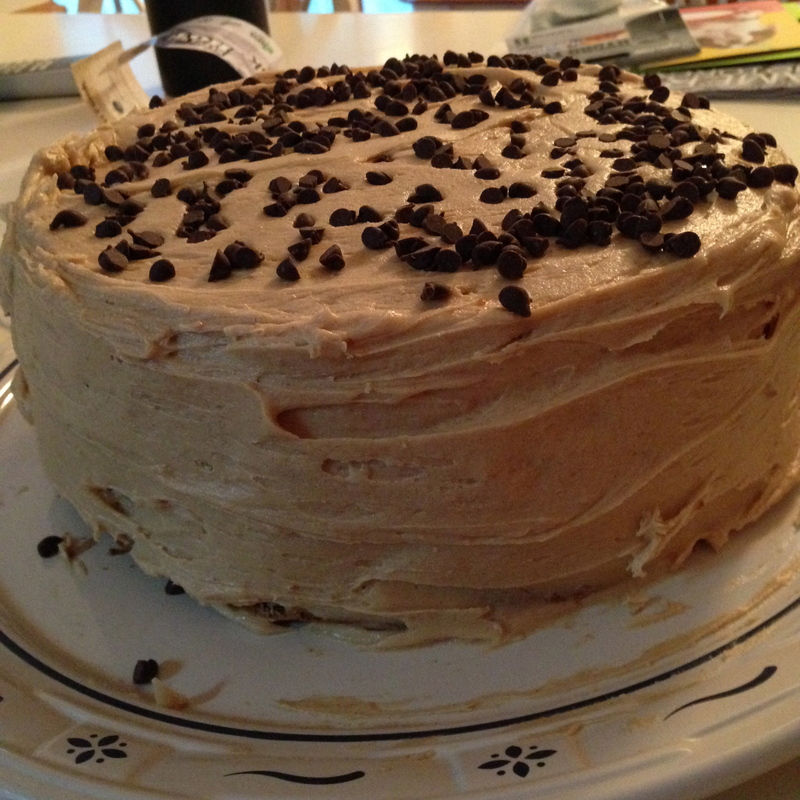 After you frost the whole cake sprinkle the top with chocolate chips and then slice off a piece and enjoy!!! Previous Post Do what you love, love what you do.